Once again, we had an interesting visit by Aidan Dodson, this time talking to us about the female pharaohs of ancient Egypt, as apposed to the Great Royal Wives of the male Pharaohs. 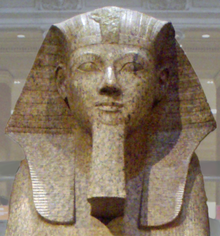 Hatshepsut is a very well-known ‘Female King’, however, there are more than just this one example across the centuries of the ancient empire. During the history of ancient Egypt, four women are known to have assumed the full titles of a king – Sobekneferu, Hatshepsut, Neferneferuaten and Tawosret. In his presentation Aidan detailed their careers and reputations, and explores the reasons for their assumption of the normally-male office of king. It was a different look at the powers behind the thrones in ancient Egypt – and very illuminating; and as the last lecture of the season, gave us a great deal to ponder about women in positions of power. Great stuff! Thanks again Aidan, we look forward to your next visit. This entry was posted in Dr. Aidan Dodson, Egyptian Society Taunton. Bookmark the permalink.